American writer Julien Green's (1900–1998) origins, artistic motivation, and identity was a source of mystery and confusion even for those that most fêted him. The first non-French national to be elected to the Académie française, Green authored several novels (The Dark Journey, The Closed Garden, Moira, Each Man in His Darkness, and the Dixie trilogy), a four-volume autobiography (The Green Paradise, The War at Sixteen, Love in America and Restless Youth), and his famous Diary. In this study, John. 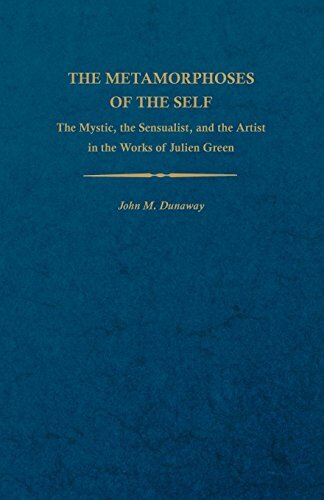 M Dunaway begins with an examination of the autobiographical context of Julien Green's works, in which the duality of mystic and sensualist is quite clearly polarized. He then proceeds through a selected series of Green's fictional works in an attempt to show the birth and nature of the third self as a personal myth of the artist. He then considers the fiction in chronological order with the intention of demonstrating the evolution of the myth of the third self in Green's career. If you have any questions about this product by University Press of Kentucky, contact us by completing and submitting the form below. If you are looking for a specif part number, please include it with your message.